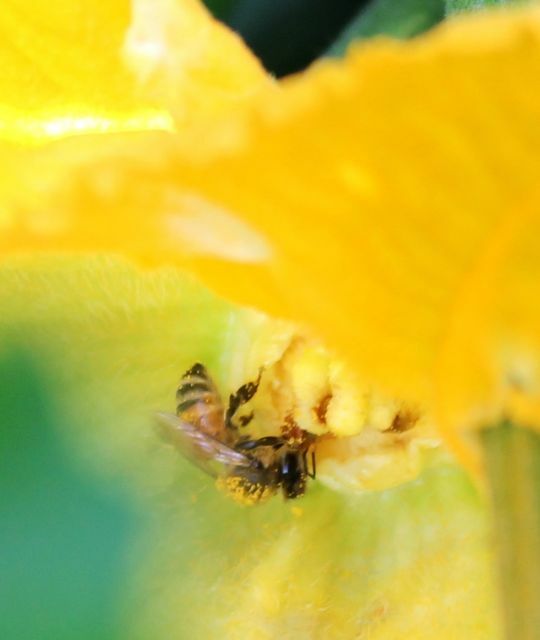 A honeybee covered in the pollen of the squash blossom it is visiting. 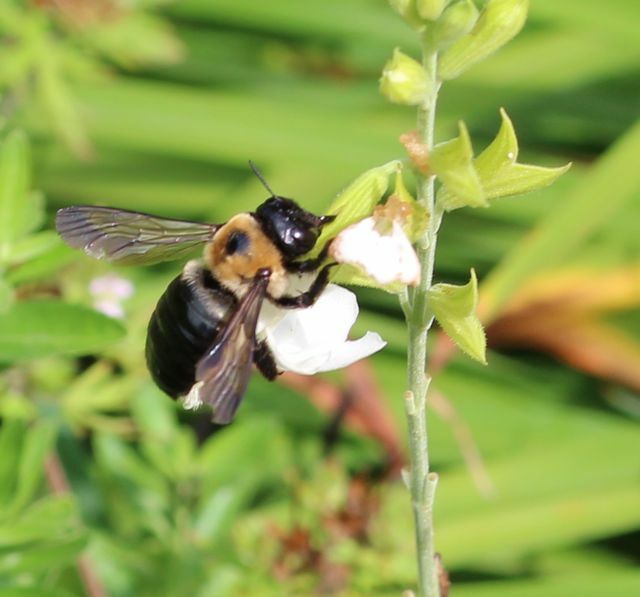 If you click on the photo to enlarge it, you’ll see the bee’s back is covered in pollen. She is the reason my zucchini fruits are multiplying at an alarming rate. The honeybees are busy on all the flowers in my yard. 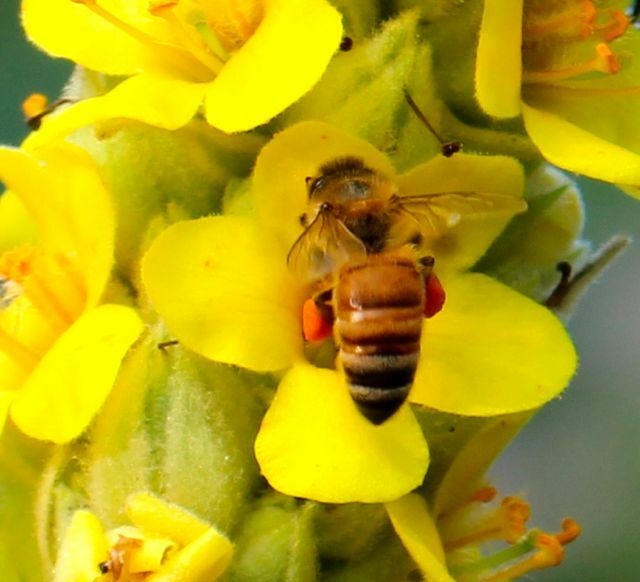 Check out the laden pollen baskets on this honeybee working mullein flowers. The honeybees like other colors of flowers too. 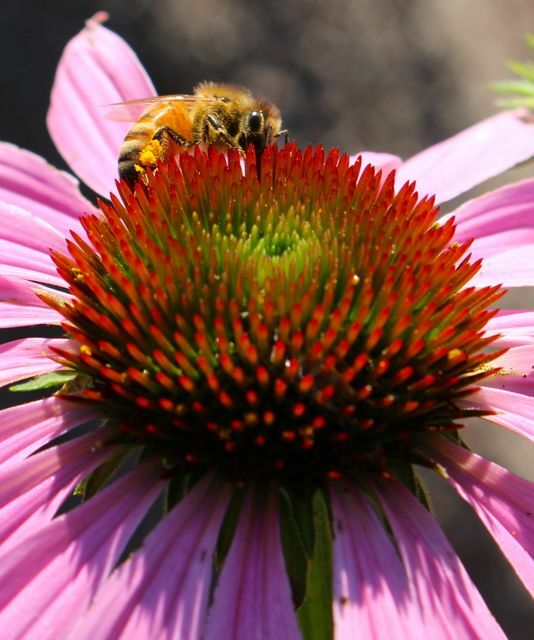 A coneflower gets a thorough visit from a honeybee. 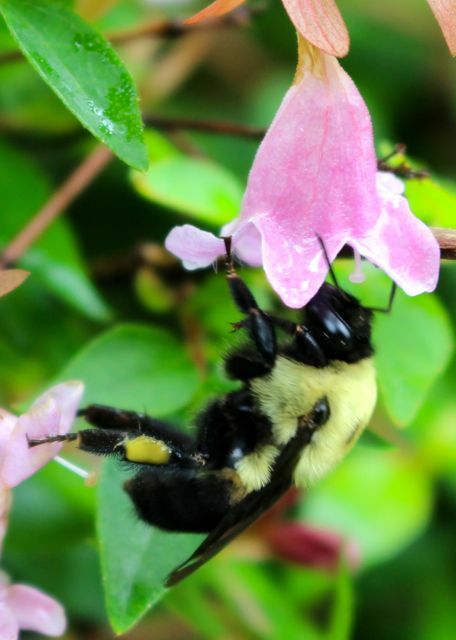 The bumble bees are less discriminating than the honeybees. They will tackle any flower. 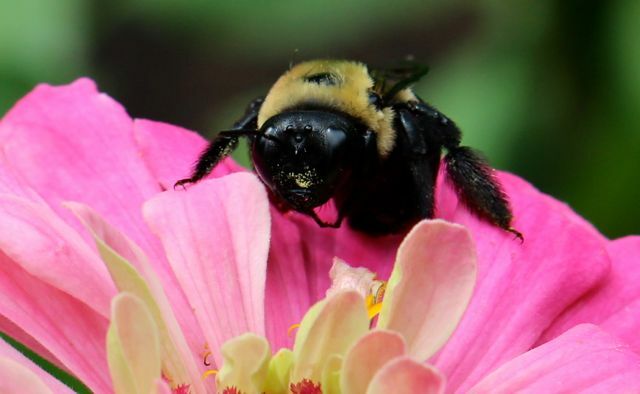 A zinnia flower gets a visit from a bumble bee. The blooming pickerel weed in my water feature is popular. 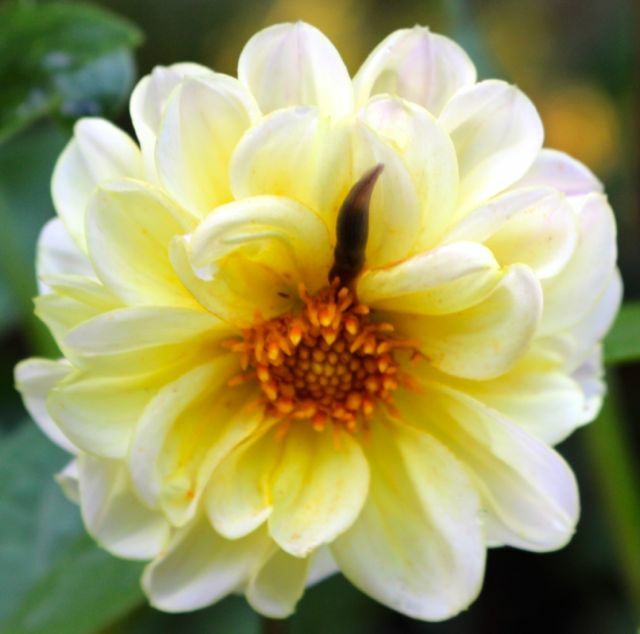 The dahlias are popular with the pollinators, but I was a tad alarmed to see what else was enjoying one. I relocated the slug after I took the photo. Finally today I saw a butterfly other than the few skippers that have stopped by. 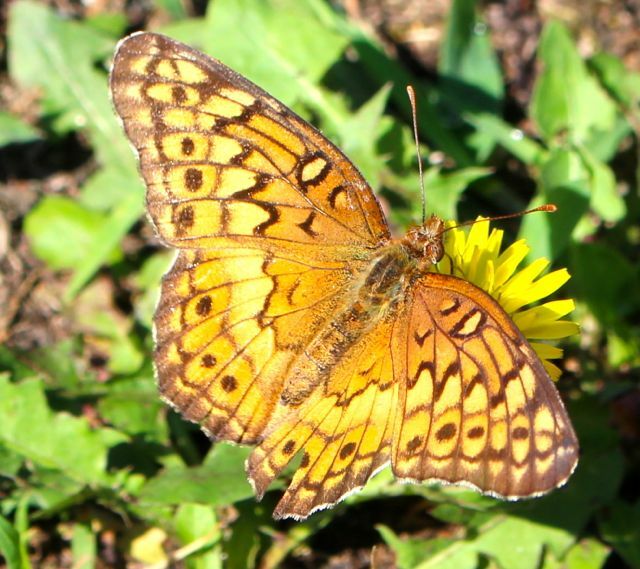 This Variegated Fritillary eschewed my pampered blossoms in favor of driveway dandelions. Three days ago, I noticed that a number of the tadpoles in my little water feature had sprouted legs. That’s a beet leaf it’s floating above. They adore beet greens. Yesterday morning just after dawn, I spotted the first two newly emerged froglets. They crawl out and sit on nearby vegetation growing around the water feature until they figure out their next move. 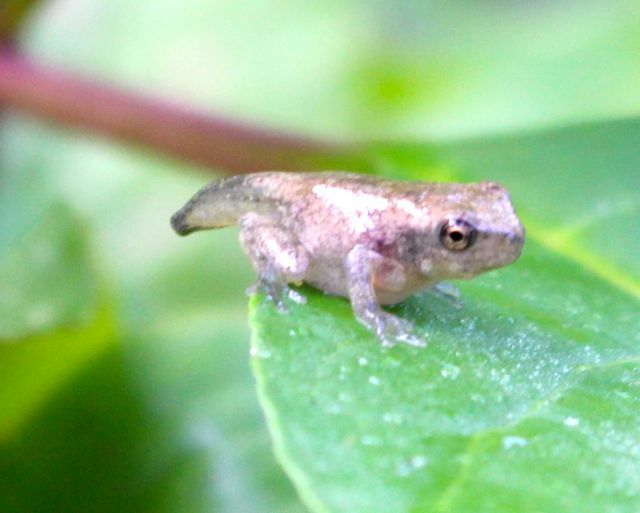 A newly emerged froglet ponders its future on a daylily leaf. 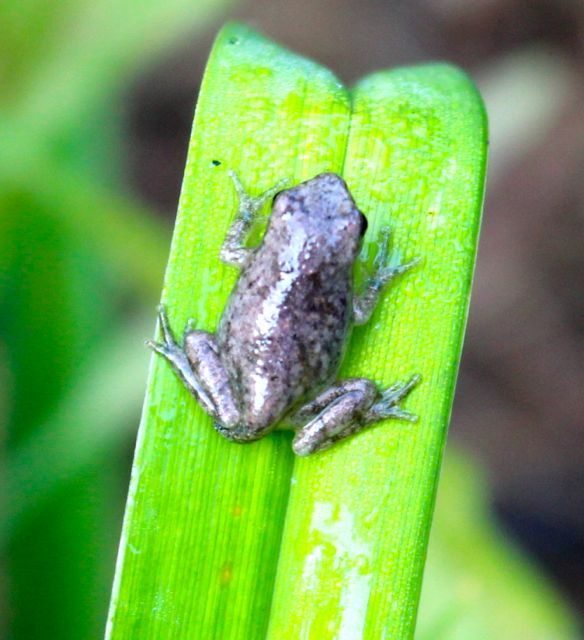 Judging by its feet, I’m guessing this is a tiny Copes Gray Treefrog. They sing lustily around the water feature on warm humid nights. But another species also sings there and lays its eggs, inserting its strongly nasal voice into the deeper chorus of the tree frogs. These are Eastern Narrowmouth Toads. This newly metamorphosed amphibian still has quite a bit of tail. I’m not at all certain, but it’s possible that this is a newbie toad. Truthfully, I’m guessing. Today five more newly metamorphosed frogs/toads were sitting on moist vegetation very early this morning. By the time the sunlight reaches their perches, they’ve moved into deeper shadows. The searing nearly summer sun is too much for their tender bodies. But they love the moist mornings. There’s a small mister in the pond that ultrasonically vibrates the liquid water into vapor that wafts around the pool on morning breezes, adding moisture to the leaves and delicate new frog bodies. Blooming pickerel weeds in the water feature with vapor from the mister swirling behind them. Everywhere in the yard and garden I see new life — tiny frogs, abundant fruits ripening in the vegetable garden, and baby birds everywhere. 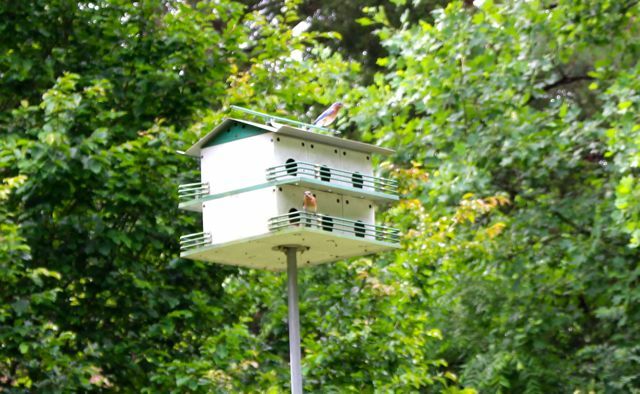 Mr. and Mrs. Bluebird raise two broods every year in this martin house. The latest batch fledged yesterday. Next time, I’ll show you how the vegetable garden is doing — assuming it doesn’t melt in this upcoming week’s heat wave. I spent two hours this morning watering everything in the hopes that I would coax some juicy rain clouds to empty on my yard this afternoon. Right now, though, the skies are not looking promising. 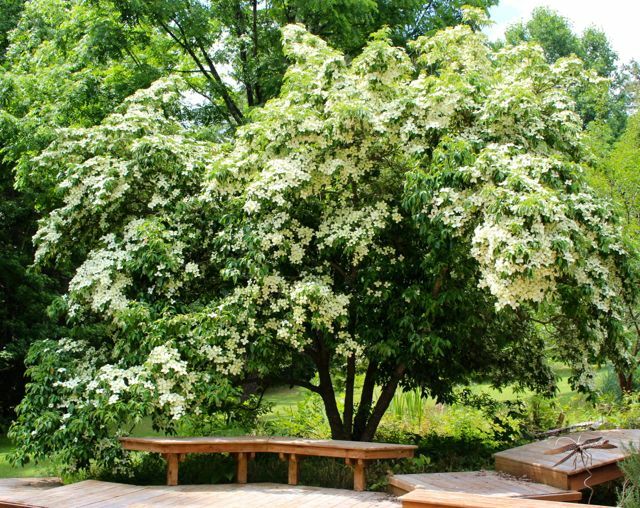 In the meantime, enjoy a shot of my evergreen kousa dogwood currently in full bloom. Every year it produces so many flowers that it’s difficult to spot the leaves. One of my favorite shady spots. Stay cool out there, ya’ll. 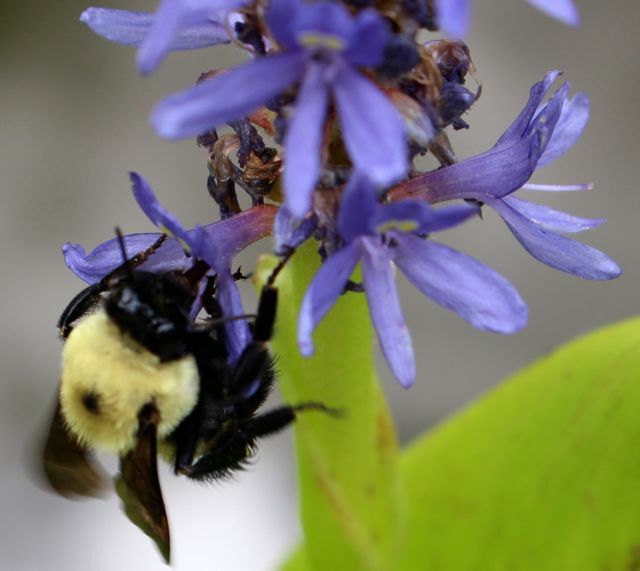 This entry was posted on June 12, 2015, 3:36 pm and is filed under Favorite Plants, Native Wildlife, piedmont gardening. You can follow any responses to this entry through RSS 2.0. You can skip to the end and leave a response. Pinging is currently not allowed.